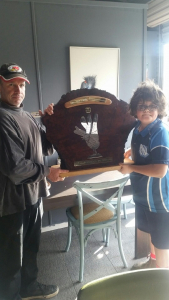 Sonny Burgess of Year 6 at Cobargo Public School was the overall winner of last month’s Sapphire Coast Learning Community Bournda Bird Olympics. This award will reside at Cobargo Public School for the next year and his achievement will be engraved on the shield. Supported by his mum and dad, Sonny aced the criteria—identifying bird species, feathers, beaks, identifying bird calls, scientific names and general knowledge from a field of around 30 students. More impressive were the bird calls Sonny could perform. His repertoire included the baby magpie, adult magpie, the little corella and the yellow tailed black cockatoo. Click here to go to the Bega District News site and scroll to the end of the page to see and hear Sonny in action.